iPhone being one of the best smartphones rarely has issues connecting with iTunes and when it does, it is not that easy to resolve. Now for instance, you plugged in USB cord to your computer to connect your iPhone to iTunes, but it unexpectedly fails to identify or recognized your device. The problem you just came across might be new for you, but this is a common problem that most iPhone users encounter. This often happens when iTunes does not recognize an iPhone device and the truth is that, it is not the iPhone that creates problem here; it is the iTunes that is the actual problem. And also this problem is very common when working on or accessing iTunes on Windows 10 pc. Don’t freak out because your iPhone is perfectly fine, so all you need to do is to tweak some settings and try some procedures that might solve the issue. So, we’ve explained some procedures you should try out in this article. Ensure that the latest version of iTunes is installed on your Windows 10 pc and it is compatible to your system. Also ensure that latest Windows software is installed on the machine and your device is turned ‘ON’. After plugging your iPhone device to the computer, you might receive ‘Trust this Computer’ alert on your iPhone; if so, quickly unlock your iPhone device and click on ‘Trust’. Note this that, you might need to reset your lockdown folder, if the ‘Trust this Computer’ continues to appear. You can unplug all connected devices except the iPhone. You can also test the computer USB port to ensure it works fine. You can also try another Apple USB cable maybe it may work. If it still doesn’t work, restart the system as well as the iPhone device. It is suggested to try another system if this procedure does not work. You can also try this method if the above procedure does not work. Now open the “Control Panel“. Then click on “Hardware and Sound“. Then select “Devices and Printers“. Your iPhone, iPad or iPod should appear in the “Unspecified” section. Right-click on it and select “Properties“. Note: If your iPhone, iPad or iPod device is not listed here, make sure that you have agreed to trust this PC by selecting the "Trust" button on the device and you are using a supported cable. So select the “Hardware” tab, then click on the “Properties” button. Now from the “General” tab, click on the “Change settings” button. Then select the “Driver” tab, then click on “Update Driver“. Then choose “Browse my computer for driver software“. Now select “Browse…” then navigate to “C:\Program Files\Common Files\Apple\Mobile Device Support\Drivers“. If this folder is not found on your system, check in “C:\Program Files (x86)\Common Files\Apple\Mobile Device Support\Drivers“. You can follow this method if the above procedure does not work on your iPhone device. 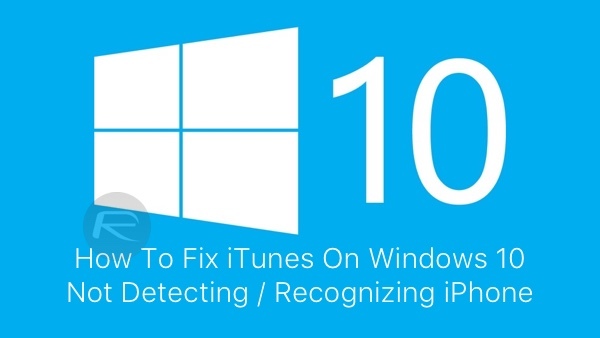 This method is focused on locating the apple driver on your Windows 10 pc, checking whether there is any problem with it and then fixing it. Now in the Search box located in the left-bottom corner on your Windows 10 pc, type Device Manager. Now press ‘Enter’ on your keyboard. Now if a down arrow sign appears next to the Apple Mobile Device USB Drive, it is recommended to right click on the enlisted Driver and then select ‘Enable’ option. Now if, on the other hand, no down arrows sign appears, question mark symbol or exclamation mark appears on the Driver; there might be a third party app that is conflicting with the Apple Driver existence. You can easily restart the Apple Mobile Device Service, if preferred. If question mark or exclamation mark exists, it is required to install Apple Mobile Device USB Driver. I think all the above stated procedure to fix an iPhone that is unrecognized by iTunes is a bit long, but that is just how resolving iPhone issues is. And it can also put your important data on risk, but don’t be panic about that. Nevertheless, there are third party apps that can help you to connect your iPhone device to iTunes with just a few clicks. One of the apps that can help you to connect your iPhone to iTunes is Tenorshare iPhone data recovery Pro which can be used to get data from iPhone. This is for those who can’t go through the long recovery procedures; the app is very useful as it provides quick and safe access to data in 3 recovery modes. In view of the fact that, due to large usage of mobile devices that amasses and retains bulk data, there can be a number of files and the file formats. Tenorshare software is acknowledged to support around 20 different file formats. It aids in synchronizing data such as videos, contacts, audio files and text messages to your iPhone. I am right about 50 - 60% of my iTunes library, are missing the beautiful cover album art and it will take me a really long time to manually find the artwork and add it to my iTunes mp3s by hand. The thing about iTunes free downloads is that whenever you download music or video from iTunes; they are all automatically stored in one place.